The sun hasn't yet brought out their scent but hoverflies, bees and wasps are exploring them already. I doubt it's acceptable to say I'm fed up with green. But I am. I've been enjoying the starkness of winter; all those silhouettes. And although it's quite nice to see the little hawthorn leaf buds opening I'm feeling world weary enough to think 'Oh, them again.'. And for me to say 'Oh, them again' about hawthorn buds shows the depths to which I've sunken. They are beautiful; delicate and bright. But just at the moment, it's 'Oh, them again'. 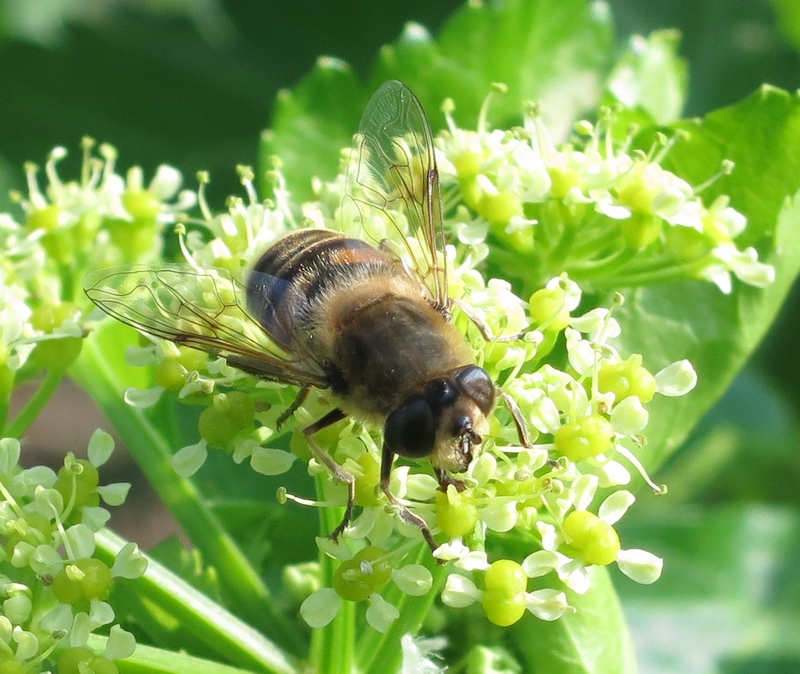 Hoverfly (Eristalis tenax) on Alexanders. For my Stuck Foot Post I stood by Alexanders. People unfamiliar with them have said they'd be interested in knowing more. So I stuck my foot by a row that stretched away into the distance and looked to see what I could see. The plants by my foot were about two-foot high. Some on the other side of the path were much taller. By summer they will be four foot or higher. 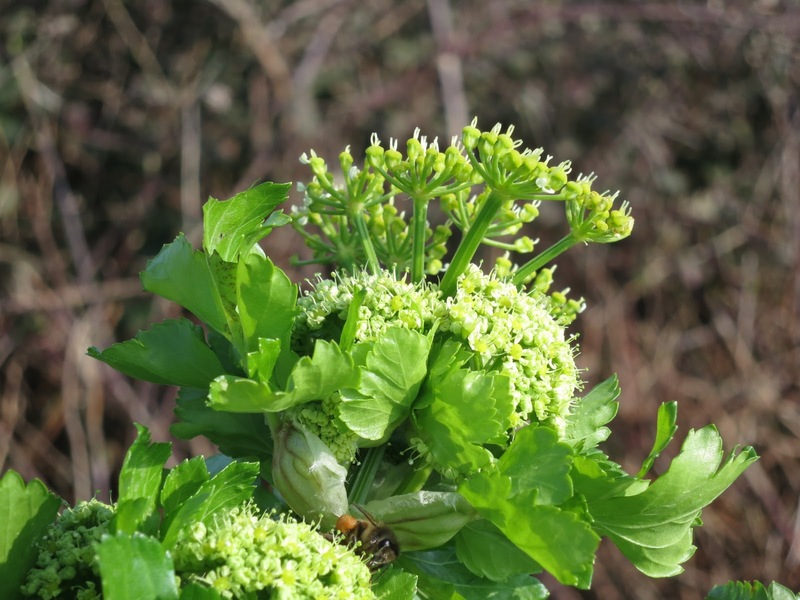 There were more than Alexanders. There was fennel and the beginnings of Herb Robert (or one of those other plants whose leaves all look like geraniums except smaller). There were dandelion leaves and an open daisy. But apart from the daisy, everything was green. A mass of leaf by leaf, stem by stem green in a long, long, long, long, glossy green row. So I went with it and excluding all others, stuck to Alexanders for this post. If you can't beat it, join it. And having joined it, it's quite pretty really. 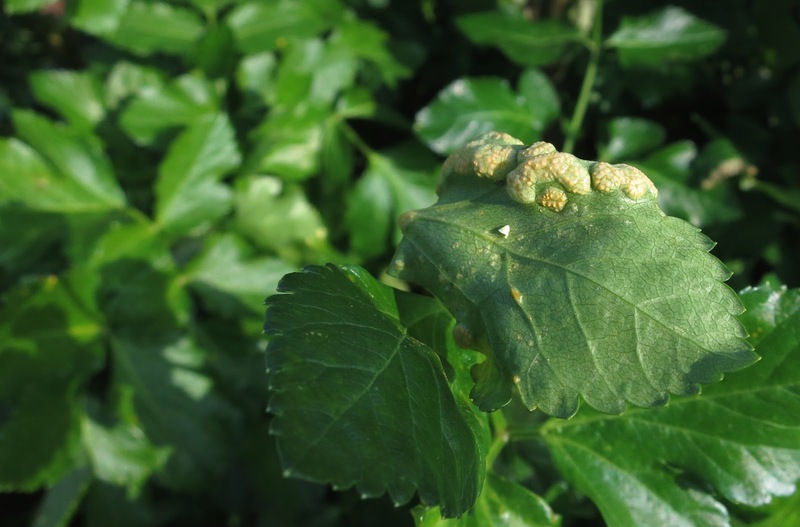 Alexanders Rust (Puccinia smyrnii) on a leaf. Sometimes, as here, it looks interesting enough to become attractive in its own right. Have you Stuck Your Foot somewhere recently? Stood for a moment without moving except for a slight sway or twist? 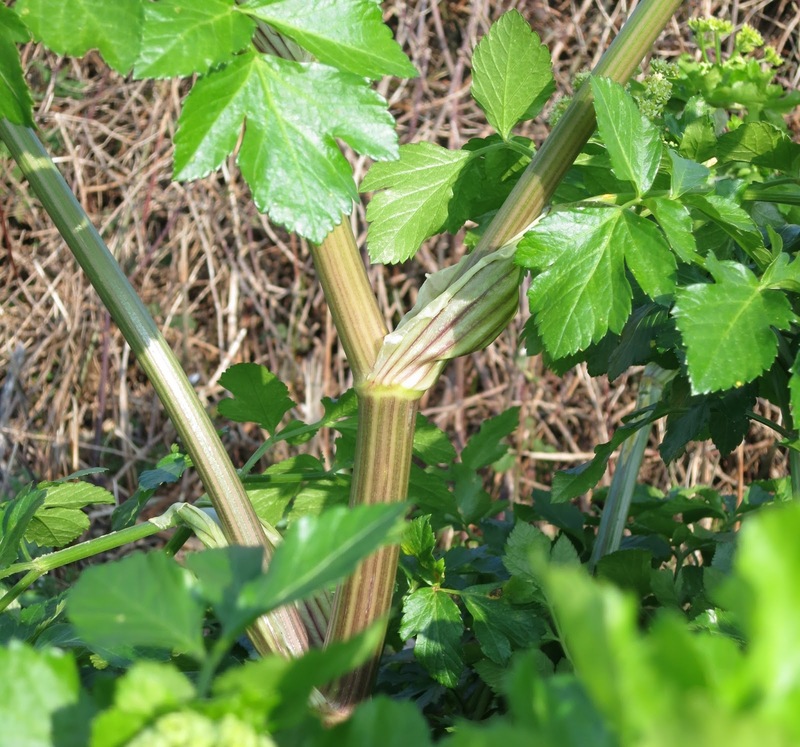 The stripy stems of Alexanders are so beautiful they make even me-in-a-bad-mood smile. If you'd like to share a Stuck Foot Post - do add it to the box. And if I can get myself to phone someone to fetch my laptop and mend it maybe I'll not feel so 'Oh, them again'y. But I'm currently stuck on that too. My laptop works sometimes. It's working now. At others it doesn't. But there's something special about the connection between an individual and his or her computer so I miss it while it's gone. And I keep postponing that call. I can borrow a friend's. But to use another's is as if I'm intruding on someone's heart. Meanwhile, how about Sticking Your Foot somewhere and staying there long enough to see what you can see without moving? . . . And share your post in the link box below? The box will be open from 7am on March 21st and stay open till 7pm on the 25th (UK time). P.S. Those who've been reading Loose and Leafy over time will have noticed I get struck down by a bout of anti-green-ness every spring and that every spring I get over it too. Lucy, I love the "foot-stucker" idea and enjoyed your so-green Alexander. My photographic skills leave much to be desired. I was at Waveland, a Kentucky historic site this morning with the dogs and tried to be a foot-stucker, but Dulcie kept tugging at the leash so I couldn't stay planted in one spot. .
Glad you are still doing these posts, it is nice to see the green, have been looking at the grass banking across from the house, it's full of moss, but on close inspection there are many other plants in there as well.If I get the chance I will do one "stuck" here, before they cut it back..
Well Lucy I am missing doing my Stuck Foot post and I am most upset....we are still surrounded by about 1-2 feet of snow especially around my garden....cold, cold, cold so no melt and no stuck foot....I'll take your green if you take my white...so expect a Stuck Foot in May. And/or a late March post in April.